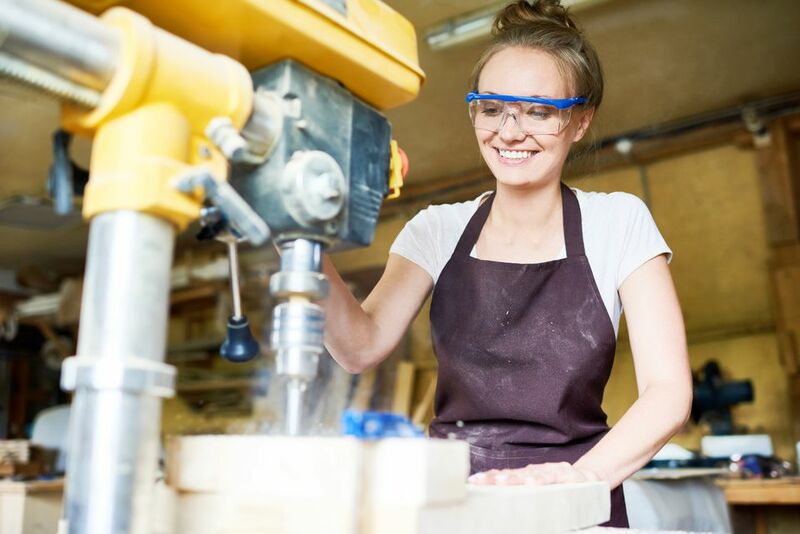 Having an accurate drill press at your disposal is one of the key advantages that fine woodworkers have over carpenters and other job site craftsmen. Not only can the drill press fashion large, clean holes more efficiently, safely and with far less physical effort than a power drill or a cordless drill, but the drill press can excel at other useful tasks, such as boring long spindle holes or serving as a spindle sander for sanding curved cuts created with a jigsaw or a band saw. Additionally, the types of bits that can be used in a drill press can be far larger and more precise. A Forstner bit is a great example. It's not advisable to use a Forstner bit to cut a flat-bottomed hole in a piece of stock using a hand-operated drill, but the drill press can handle the job effortlessly. In order to perform any of these tasks, the key component of the drill press, the chuck, must be in good working order. If your chuck is not gripping the bit securely or if it is stiff or out of alignment, your drill press will not operate properly, and you'll notice that the holes you drill will not be as precise as if the chuck were functioning in an efficient manner. What Is a Drill Press Chuck? The chuck of the drill press is typically a three-jawed clamp that tightens evenly and securely around the shank of a drill bit. Most drill press chucks are at least 1/2-inch in the opening size (the diameter of the shank it will accept), and many are up to 3/4-inch in the opening. The chuck is tightened by a geared wrench, called a chuck key. To install a bit, you merely insert the shank of a bit into the chuck and hand-tighten the collar until the jaws evenly and securely hold the bit, then insert the tip of the chuck key into one of the holes on the chuck above the collar, aligning the gears on the key with the gears on the chuck. Rotate the chuck key clockwise to tighten the chuck, or counter-clockwise to loosen the chuck's grip on the bit. To clean your chuck, first, disconnect the power cable from the outlet for safety. Then remove any bit in the chuck, and rotate the collar so that the jaws are fully extended. Wipe the chuck clean with a dry, lint-free cloth. Next, retract the jaws completely, and blow any sawdust out from within the jaw opening using an air nozzle connected to an air compressor. This will blow out any loose sawdust or grime from within the jaws of the chuck. After cleaning the chuck inside and out, lubricate the chuck by spraying a small amount of a quality drying lubricant (such as Boeshield T-9) into the open jaws of the chuck. Rotate the collar, extending and retracting the jaws a couple of times until the lubricant is worked into the mechanism, then wipe away the excess. TIP: When using an air nozzle to blow out any loose particles, wear a pair of safety glasses to protect your eyes from any flying debris. Most drill press chucks are removed in a very different manner from the keyed or keyless chuck on a hand-operated drill. These small chucks are removed by loosening a set screw within the open jaws of the chuck. However, on a drill press, in most cases, the chuck has a tapered shaft that is pressure fit within the spindle. To begin removal, pull down on the handle to lower the quill and chuck as far as it will go, and rotate the quill lock to hold the mechanism in the lowered position. Next, look for a large vertical slot within the shaft of the quill. Some drill presses are equipped with such a slot, into which a chuck removal key can be inserted. A tap on the end of the removal key with a mallet will knock the chuck out of the quill spindle. If your chuck does not have a removal key and corresponding slot, raise the quill until the top edge of the chuck collar is about 1/2-inch below the drill housing, and tighten the quill lock to secure the quill. Then slide the mouth of a large open-end wrench over the quill spindle just above the chuck collar. Push up firmly on the large wrench to pry the chuck out of the quill spindle. With the chuck removed, wipe down the tapered shaft of the chuck with a dry, lint-free cloth. Then blow out the opening at the bottom of the quill spindle with compressed air to remove any grime or sawdust. To replace or re-install your chuck into the quill spindle, raise the quill to the highest position and tighten the quill lock to secure the spindle. Rotate the drill press table out of the way so that it will not interfere with the installation of the chuck. Next, slide the tapered chuck shank into the quill spindle. Rotate the chuck slightly by hand until the square head at the top of the shank fits into the receptacle within the quill spindle. Retract the jaws fully, and smack the bottom of the chuck one time firmly with a mallet to seat the shank of the chuck into the quill spindle. Rotate the chuck collar to check the operation of the chuck, then plug in the motor and insert a drill bit into the chuck to make a couple of test bores to ensure that the reinstalled chuck is functioning properly.